The Pound Sterling (GBP) has had a varied showing against the Euro (GBP/EUR) and the US Dollar (GBP/USD) today, trending narrowly in the negative against the former and posting a 0.2% gain against the latter. The next results to affect the trinity strongly will be the UK Mortgage Approvals figure for August; fortunately for the Pound (GBP), a rise from 68.8k approvals to 69.8 is predicted. Later on, however, the Euro (EUR) may steal the show with the German CPIs for September, although as of present, nothing positive has been predicted for these results. Last night, the US Dollar (USD) received a blow as Federal Open Market Committee (FOMC) voting member Charles Evans said that he did not support a US interest rate hike this year and would also not be doing so until mid-2016. On the other hand, Evans’ fellow FOMC voter John Williams was in favour of an early interest rate increase. The Pound Sterling (GBP) has risen by 0.2% against the Euro (GBP/EUR) today and has made marginal gains against the US Dollar (GBP/USD). 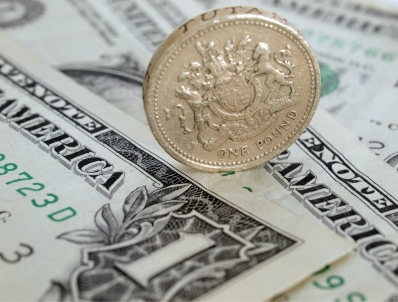 In the absence of direct data, the Pound (GBP) has made middling movement today, although considering how many high-impact US economic publications are due this afternoon, a downtrend seems in store, at least against the US Dollar (GBP/USD). The US Core Personal Consumption Expenditure for August is the most notable of the due releases, while later on, talks by Fed officials Charles Evans and John Williams may continue to support the ‘Greenback’ (USD) if bullish statements are made. The Pound Sterling (GBP) fell steadily against the Euro (GBP/EUR) and the US Dollar (GBP/USD) last week, owing mostly to Bank of England (BoE) comments scaring off investors. Although the Pound Sterling (GBP) posted gains of 1.3888 against the Euro (GBP/EUR) last week and 1.5561 against the US Dollar (GBP/USD), the Pound failed to hold these advantages and saw respective lows of 1.3504 and 1.5163 over the course of the week. As the biggest UK results of the week arrived early on Tuesday, for the rest of the time Sterling was blown to-and-fro by BoE comments and additional external events. On Monday, the Pound actually benefitted from BoE news – Deputy Governor Sir Jon Cunliffe gave bullish statements on the UK economy and, particularly, on the possibility of a UK interest rate hike before the end of the year. This was countered by an expansion of the UK debt level being shown on Tuesday and the raw nerve of the ‘Brexit’ situation being touched on by mentions from French Economic Minister Emmanuel Macron. One of the final two nails in the coffin came on Friday when BoE Deputy Governor Ben Broadbent recommended a rate cut instead of a rise at the next available opportunity. The second point came when the BoE Financial Policy Committee (FPC) identified a potential threat to UK growth in the form of a 40% increase in buy-to-let mortgages since 2008, which could be setting up a housing price crash under certain circumstances, according to the FPC. The US Dollar (USD) came out as the clear winner last week, hitting a peak of 0.6594 against the Pound Sterling (USD/GBP) on Friday, close to the high at the start of the month of 0.6594. The Euro (EUR) also managed to take the lead against Sterling (EUR/GBP), hitting 0.7405 on Thursday last week. The value of the Euro was harmed during the week by declining PMIs on Tuesday, a mixed forecast for Germany’s economic future on Thursday and the ongoing Volkswagen scandal, but the US Dollar enjoyed a largely positive week overall. In addition to having the most economic releases compared to the UK and Eurozone, the ‘Buck’ was most supported by hawkish statements from Fed officials such as Dennis Lockhart and Janet Yellen, both of whom put a US interest rate hike on the table before the end of the year. The Pound Sterling (GBP) and the Euro (EUR) have a number of key reports due for release this week, but as with the last, the US Dollar (USD) seems set to steal the show. On Tuesday, the UK Lending figures are in; this is followed on Wednesday by the UK Q2 finalised GDP and Manufacturing and Construction PMIs towards the end of the week. The Euro will likely be moved by the German and Eurozone CPIs and German Unemployment rate for September on Tuesday and Wednesday. The CPIs are particularly important as they are likely to influence the European Central Bank’s (ECB) immediate thoughts on quantitative easing, and may even prompt a statement on this subject. The US Dollar, however, has the Consumer Confidence score for September, the US Unemployment Rate and Change in Non-Farm Payrolls results, in addition to a host of planned speeches from Fed officials throughout the week. The Pound Sterling to Euro (GBP/EUR) exchange rate was trending in the region of 1.3589, the Euro to Pound Sterling (EUR/GBP) exchange rate was trending in the region of 0.7359, the Pound Sterling to US Dollar (GBP/USD) exchange rate was trending in the region of 1.5194, the US Dollar to Pound Sterling (USD/GBP) exchange rate was trending in the region of 0.6581, the Euro to US Dollar (EUR/USD) exchange rate was trending in the region of 1.1178, and the US Dollar to Euro (USD/EUR) exchange rate was trending in the region of 0.8950 near the end of the European trading session on Friday.